This journey although lacking any major scenic interest links together a number of points on interest and provides a comfortable way of travelling through this part of Europe. Using a Deutches Bahn Inter-City Express, you will, if you are lucky, be able to enjoy the view from behind the driver in the small lounges that these trains have at each end of the train. 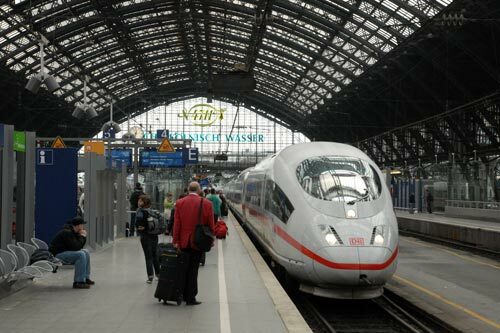 Photo - 12.46 Cologne to Amsterdam ICE-3M under the wonderful roof at Cologne Hbf. Departure from Cologne Hbf. was one time at 12.46 with unit 4604 slowly threading its way through the complex tracks at the eastern end of the station. Immediately after leaving the platform, the massive walls and spires of Cologne Cathedral rise to the right hand side and these provide a dramatic start to what is a journey completed at a somewhat leisurely pace with an average speed of just over 60 miles per hour for the onward journey. Crossing the Rhine on the Hohenzollern Bridge, the most heavily used railway bridge in Germany, the line turns north towards Dusseldorf and Duisburg. There is nothing exceptional to see from the windows as you head north through this urban area. Leaving Duisburg station with its massive railway yards now derelict, the train enters more rural surroundings as you follow the Rhine northwards. Sadly you never get sight of this great river. Shortly after passing Emmereich am Rhein you cross the border into the Netherlands and the town of Zevenaar. These days border crossings pass without passport controls and the only clues you are in the Netherlands can be gleaned from car registration plates and the fact you have passed a windmill! Continuing northwards at a very leisurely place you soon reach Arnhem. Schools are finishing for the day and swarms of bicycles are heading home along special cycle tracks with their own traffic lights. At the station a sea of bikes stand chained to racks waiting their owners return from the daily commute. The line swings west bound for the University City of Utrecht. At the station there is plenty of construction activity with new railway lines being built. Busy platforms and bright yellow trains confirm it's the Netherlands as we head north on the final stage to Amsterdam. Alongside on the right, the line runs parallel with a busy canal. This is the Amsterdam-Rhine canal and is the most heavily used waterway in Western Europe. Heavily laden barges share the water with an occasional cruise ship with neat rows of balconied outside cabins. Its fascinating seeing how well used the canal system seems to be. A captain's car is stowed on deck beside a row of potted plants with washing drying in the breeze. It might be nice to wake up somewhere different each day. There is little room for agriculture now as you enter the outskirts of Amsterdam. Apartment blocks, distribution centres, shopping and car parks are now the emblems of city life. The train slows and smoothly comes to a halt under the arched roof of Amsterdam Centraal station. Sadly the journey is over. Outside the station the familiar trams, canals and city life are in complete contrast to the calm of the train journey.